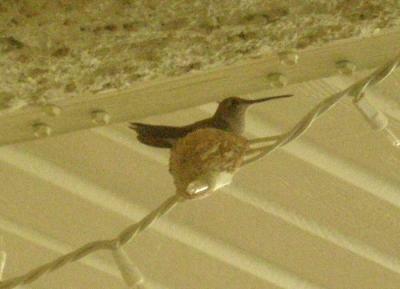 The following is a story and photo of an Anna's Hummingbird that nested on the patio. 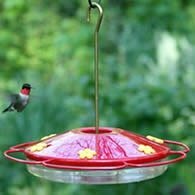 This year, around the beginning of June, we noticed a hummingbird was flying through the covered patio area an awful lot. It would stop close enough to us, that if possible, we could put our hand out and touch it. My mom and I thought that we had just made a new friend! The bird would stop by several times a day and hover above us as to say, "So you're having coffee again today, do you have anything for me? Maybe some nectar?" That being said, we purchased the feeder and nectar, which she seems to be enjoying. Well, the hummingbird continued to visit us on the patio several times a day, and started sitting on a string of mini white Christmas lights that my mom keeps up all year long. Then just a few days ago, I noticed a big lump on the string of lights. Surprise, the bird is building a nest around the string of lights! And all this time we thought she was just coming by to see us. Now, with each passing day, the nest is getting bigger and bigger. We don't see any eggs in the nest yet, but the bird is getting a bit territorial. We attempted to walk out onto the patio around 1:00am for coffee and when we turned the patio light on and went to open the door, she came charging at us. We had to shut the door very quickly, and then she started pecking at the glass to warn us not to come out. Well, we didn't. We gave her some privacy that night. She has not threatened us since and still comes by throughout the day and night and sits in her little nest. We can't wait to see if she actually lays some eggs soon. 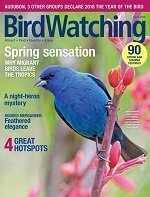 I was just sitting out on our patio here in Phoenix talking on the phone and a hummingbird flew in as I was telling my friend about it I looked up and saw it had lighted on a big white looking bulb (about the size of a golf ball) on our light string close to the ceiling. I initially panicked and thought it was a wasp nest so my husband got the wasp killer and was getting ready to spray when it hit me that why would a hummingbird light on a wasp nest so we stopped and I came to see if there was anything on the net..thank god for your story. 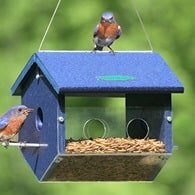 I hope she doesn't mind sharing the patio...I guess I should get a HB feeder..this is so neat! I'm writing to update on our little patio friend and I also hope someone can give me some much needed information. Well, we expected the eggs to hatch around the 4th of July, but they didn't. Valerie left the nest 2 days ago and has only been back once or twice for a few minutes. We became concerned, so today we took a mirror and held it above her nest to see what, if anything, was happening. Unfortunately, one of the eggs is broken and it looks dried up. I'm wondering if Valerie is so devastated that she has flown the coop. At this point, the other egg is still intact. Is it possible that she may be so depressed about the "mishatch" that she will leave the nest forever? If anyone has any clues about this terrible situation, please respond. Thank you. UPDATE: The hummingbird, (we call her Valerie) was spending more time in her little nest over the weekend, so we decided to take a peek in there when she was away. Guess what? As as 6/22/09, there are 2 eggs in the nest. I'll keep you updated through this comment area. If I get to see the babies, I will post a new photo and story about them. What a cute story! I wish I had a Hummingbird at my house having coffee with me! Take care of the babies and take pictures. We will be waiting to read your next story. What a nice story. 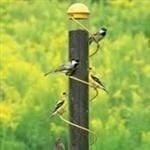 How sweet of you to go out and get a feeder. 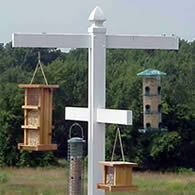 I started putting out feeders two years ago, and had some Annas Hummingbirds coming to them. Then I planted some Salvia's which they love. This year.. I have five different species coming! Who knew the Desert has so many migratory Hummers! I too am in the desert. I've since found we are abundant in desert flowers, that they come to. They are so amazing to watch. How awesome that your little friend built a nest where you can see it! I am so surprised that the little one "charged you" They buzz my head all the time.. but I don't think to tell me to stay off my patio! I've had them literally not wait for me to get up to the tree as I was walking out with the newly filled feeder.. so I stopped and held it.. and the little one landed and perched and drank! Truly amazing. A few times that has happened. Do you think that its possible since you turned the light on, that the lil hummer saw its reflection in the window and tried to defend her territory by going for her own reflection? That happens sometimes.. and they can ding themselves pretty good by it. No doubt they ARE very territorial. Mostly the Annas. I witnessed an all out aerial brawl between a Costa's hummingbird and an Annas. They even went to the ground.. beaks clashing and all. But were ok, since they finally parted and flew off in separate directions. 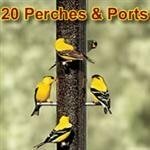 My feeders have some good distance to them.. so it helps to calm down any aggressions. 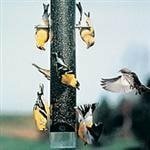 Don't be surprised if you see something bigger on your feeder!. 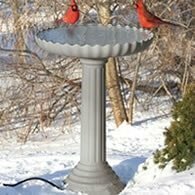 There are many fruit eating birds.. that will come and drink from them. 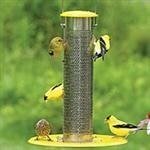 My feeders are so darn busy. Its truly wonderful to see them all. Do write and tell us when you see little ones! Use a similar title.. so we can recognize it! Enjoy! Don't forget to replace the old nectar after four or five days! Great Story, I will have to check everyday with you to see if there are any new additions to the family! Now that your not allowed on the patio anymore you will have to have your coffee in the front like before until her babies are born. Congratulations on the upcoming event.